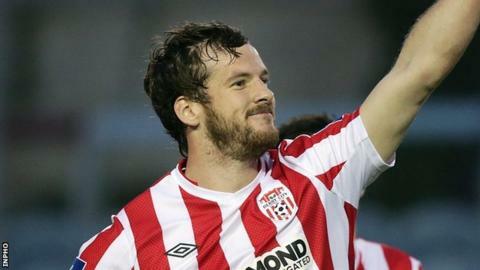 Derry City are without three suspended players for Saturday's Premier Division game against Drogheda United. Ryan McBride, Philip Lowry and Cillian Morrision are all serving bans as the Candystripes hope to build on their 1-0 win over St Patrick's Athletic. Stephen Dooley is recovering from a hamstring injury but manager Peter Hutton will consult medical staff about his availability. Derry lie eighth in the table, with Drogheda two points behind in 11th. "There are about six teams in the mix at the bottom and it's imperative that we stay at the top of the pile," said Hutton. "When a new manager comes in, the players are trying to impress him and on the last two occasions we have faced that scenario we have lost."